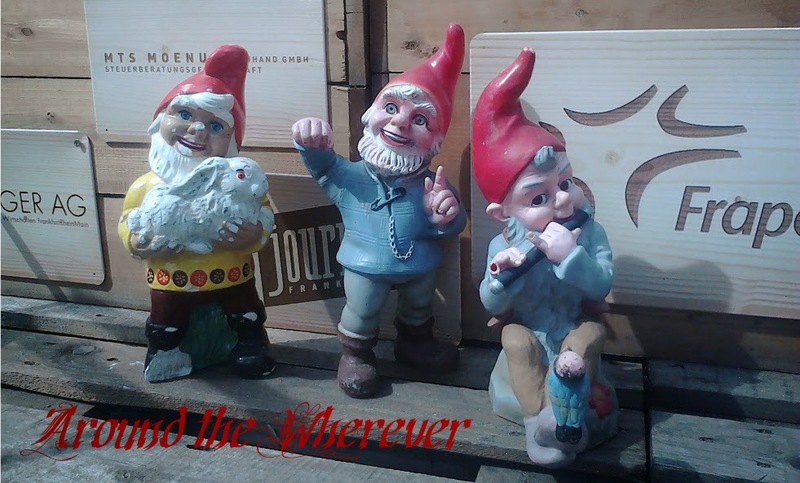 Around the Wherever: My week: April 17 ed. -The German class went sooo much better this week. Our teacher is a perceptive chap and I think he made some accommodations to the lesson and we didn't have the mass failures in understanding that we had the week before. -A, M, L, and I took a trip to Bonn to see the cherry blossoms. 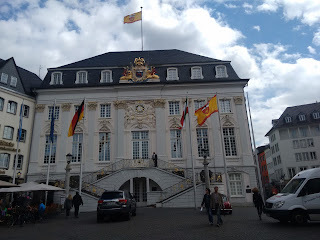 Plus, it was the opportunity to see the former West German capitol. What struck me immediately was how many people were already drinking beer or were buying beer; we arrived at 10 a.m. so I wasn't expecting that. However, I think that it was possible that the individuals were ones who might live on the streets. I was curious about the dynamics of the area. Beyond that observation, we changed our focus to a visit of the cemetery. Have you visited a German cemetery? They are often quite lovely, a peaceful memorial to those already gone, and make for a picturesque walk that effects memento mori. 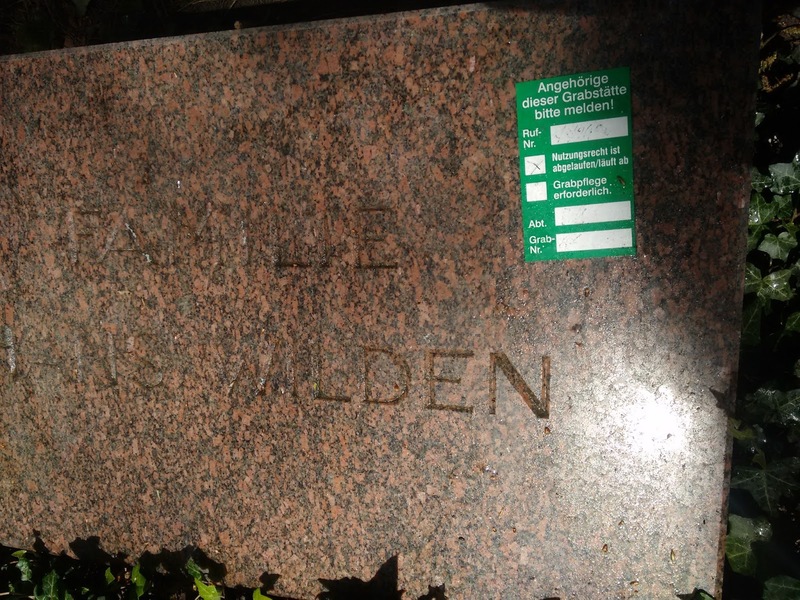 The interesting thing about German cemeteries is that one just rents the burial plot for a certain amount of time. If the remaining family does not renew the lease, the remains are removed and the grave will be rented to someone else. In fact, we saw a notice on one of the graves that the rental time had run out and the relatives have to contact the office. Leaving our mortal musings aside, we continued to Heerstraße, the focus of our trip. 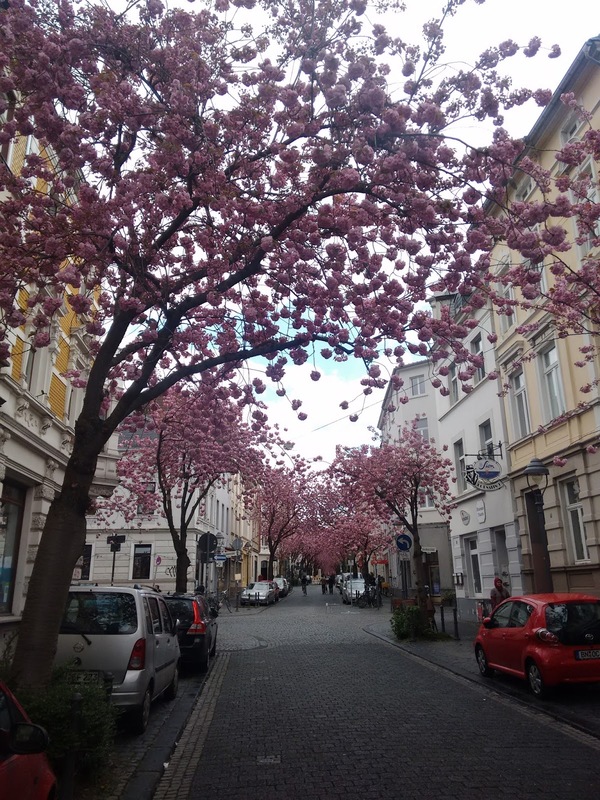 On this street, the magical cherry blossoms of Bonn were in full bloom. We wandered through the streets, dodging cars and bikes piloted by those frustrated by the gawkers, and a disproportionate number of Asian tourists. The street was absolutely beautiful, with classically styled houses and pink blossoms. 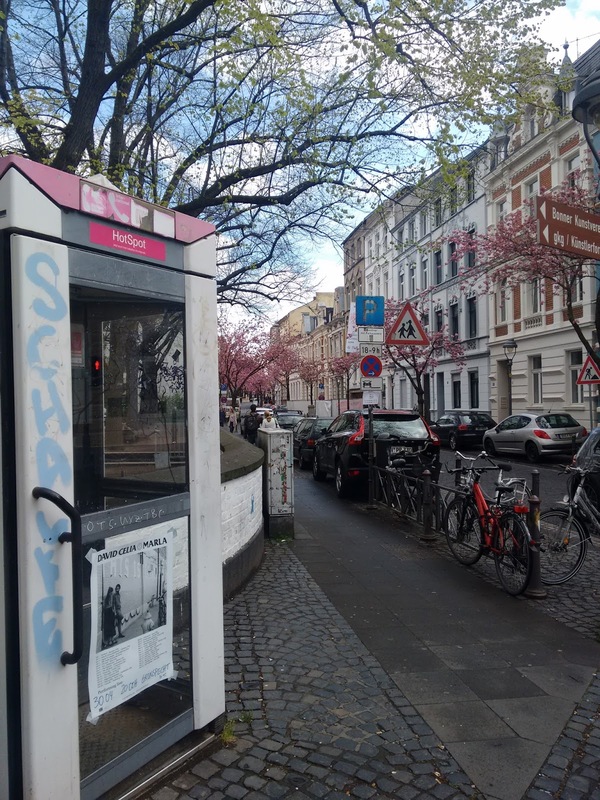 At the beginning of the street, we were treated by two men conducting what I assumed was a drug deal in a defaced and non-operational phone booth. After all, who uses pay phones any more, especially when there's no phone inside? They finished up the deal and a cop drove by about a minute later - too late to investigate the shady business. 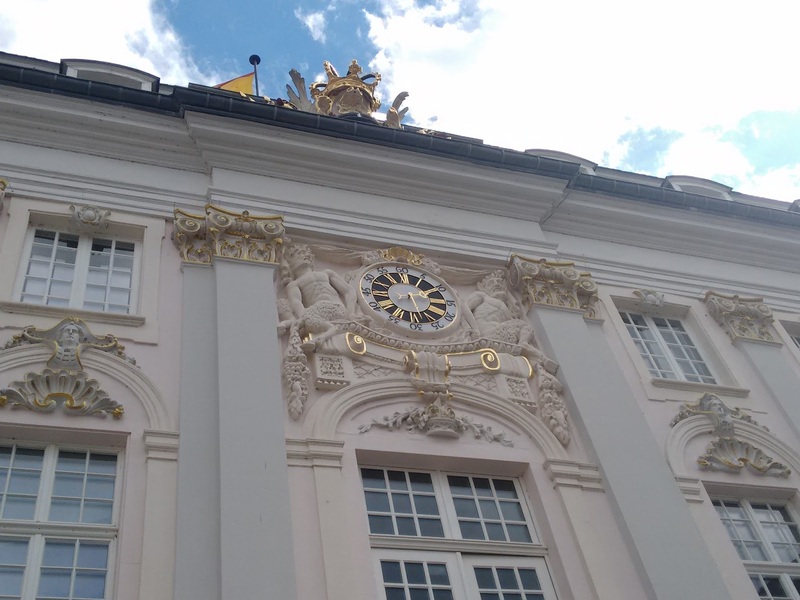 Oh, Bonn, what a city of contrasts you are. Pictured: the notorious phone booth in question. See the pretty cherry blossoms behind it? Bonn is a place of contrasts. Pictured: a much nicer, and presumably drug-free, stretch of the street. For lunch, we visited BurritoRico, which is kind of like Chipotle: order and pick toppings for your item at the counter. I ordered some pork tacos (yeah, not so vegan that day) and some nachos. I wasn't super impressed with either item; the corn taco shell was not heated well and even the cheese on the nachos wasn't very warm either. Plus, it's that liquid style of cheese instead of shredded cheese. My friends liked their food well enough and I didn't hate my food but felt a bit "meh" about it. We continued downtown after lunch. My friends wanted to visit the Beethoven Haus Museum so I dropped them off and wandered around downtown, window shopping and finding the lay of the land. The downtown area is your typical German downtown pedestrian zone but has some interesting features, such as the Altes Rathaus. I really like the clock on it, and it's somewhat unusual in that instead of showing just 1-12 for the time demarcations, it also showed the corresponding numbers in five minute increments. I'm sure that kids who are just learning to tell time greatly appreciate that! Soon I met up with my friends again and we headed back home. -The next day, a bunch of us met for our monthly gathering. We ate a delicious lunch and played Mafia, a party game. It was a good end to the week.